Questar III BOCES helps school districts operate more efficiently and cost effectively by pooling their resources and sharing costs. BOCES services are created when 2 or more districts have similar needs that can be met by sharing staff members, classroom/office space, equipment, time or expertise. Questar III has no taxing authority. It is funded by the districts forming the cooperative. Except for the administrative and capital budgets, which are based on each district’s enrollment, Questar III districts pay only for the specific services they use. All services and programs (except for administration and rent) must be requested, in writing, each year. As an incentive to cooperate and share resources, New York provides BOCES aid to partially reimburse districts for BOCES services. Aid is distributed to districts based on a state approved formula. 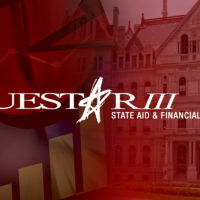 Questar III prepares a tentative budget for component school districts each year. Questar III conducts financial audits to ensure that it is operating in accordance with the highest standards of financial competence and integrity. Results from the organization’s external auditors are available below.